When debating Arabs in Europe we often get just one side of the argument on regional press and media. The recent cartoon saga has added negative impetus to the rapidly falling avalanche of 'wrong assumptions' and 'negative stereotyped images' forming the concept of 'who the Arabs are', 'what they believe and not' and 'what they are up to'...etc. I wanted to see what’s on the other side of the wall. Not just peep through it, but jump and walk to our fellows in North Africa...Reading their opinion columns and analysing their thoughts on the topic. What I came across was both surprising and sometimes shocking: Muslims in Europe do not feel welcomed. Places like Denmark, France and the United Kingdom have become hot beds breading anti-Arab feelings that existed long before September 11th 2001. No wonder Arabs are consistently portrayed as 'terrorists', 'threats to society' and 'undesirables'. It is hard to debate the issue just by reading articles, especially if these are written from one stand point. Harbouring opinions based on pre-conceived ideas can stir debates climaxing in increased misunderstandings, and with ignorance so rampant on multicultural affairs, on both sides of the argument, hatred can be a dangerous outcome. Few people here in Europe recall the events in Bosnia during the 1990's, where thousands of Muslims where massacred whilst the EU just watched over and the pathetically weak UN stood on 'a pause'. News pundits in the west seem to suffer from selective amnesia and this hurts the average, well educated Arabs that contrary to what many here in Europe may think, do exist as a growing reality. Europe adamantly (and justifiably) scorns anti-Semitism* and its propagation is tantamount to a crime; Just stating that the Holocaust ‘did not take place’ can end you up you in a prison cell...But talking bluntly against Arabs or ridiculing their traditions or culture is often implicitly tolerated. The last 30 years (mainly characterised by the Israeli-Palestinian saga) have seen the Arabs and their many causes very often in the news. Negative portrayal of Arabs in the media has fuelled the understanding that being an Arab means necessarily an endorsement of a life of struggle, of supporting an ‘Intifada’ or ‘Jihad’. Not surprisingly, Arabs have become a popular subject of ridicule in everyday jokes; they are associated with bomb making, suicide missions and host of other sensationalisms and exagerations. Once again ignorance about international world events and mostly the post second-world-war Middle East history brings forth many pathetic misunderstandings in Europe about what may very well be a number of 'objectively understandable' outcries by Arabs the world over. A number of sociologists and media experts believe that the Danish cartoons may not be just a remote innocent occurence. Nazi Germany propagated similar cartoons (albeit in a definite explicit fashion) in the 1930's depicting Jews 'like mice or cockroaches infesting the German motherland'. These cartoons were instrumental in softening the German folks' psyche to what was to become their implicit if not completely 'naive' complicity in the greatest mass murder and nationally organised genocide in recent history. 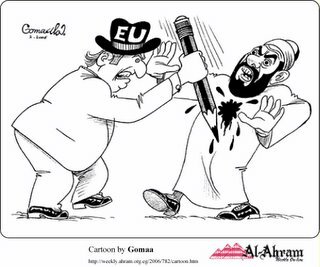 In this light the Danish cartoons, which I perceived as 'innocent' at first glance, could have deep and long lasting effects on the growing rifts between liberal (or post Christian) Western European values on one side, and the numerically expanding Muslim population on the other. It is scary. And both sides of the argument are evidently afraid. And as fear breads panic, it is imperative for leaders on both sides to seek common ground. My aim in this blog is to create a healthy debate where both sides of this thorny argument can be discussed. I believe that it is just a drop in the ocean, but why not? 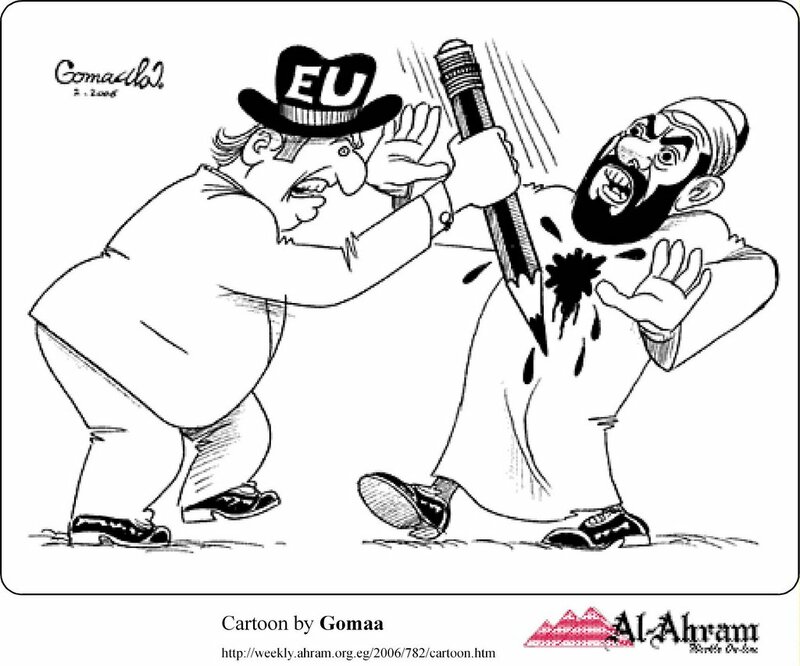 The pen is mightier than the sword...No? -- "Denmark's reputation as a nation with a long tradition of tolerance toward others ... is something of a myth." "What foreigners have failed to recognize is that we Danes have grown increasingly xenophobic over the years. To my mind, the publication of the cartoons had little to do with generating a debate about self-censorship and freedom of expression. It can be seen only in the context of a climate of pervasive hostility toward anything Muslim in Denmark." 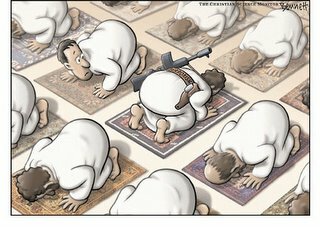 The reaction in Canada and the United States to the offensive Danish cartoons about the Prophet Mohammed has been a very civilized one. Newspapers have refrained from printing the cartoons and Muslim demonstrations have been peaceful. That's great, but the views of newspaper readers show a mixed response. Of the negative opinions, a few stand out accusing the Muslim world of being uncivilized, violent, barbaric and uncultured. "Uncivilized, barbaric, uncultured." It was, after all, the "barbaric" Muslim world that massacred 6 million Jews! Six million people - a mind-boggling figure - deliberately rounded up for elimination. Not in some remote "barbaric" jungle, or by some terrorist group, but in the heart of "civilized" Europe by a "cultured" government right next door to where the present offensive cartoons originated. And that was barely 60 years ago, not 2000 - unbelievable as that is, and with the collaboration of numerous Europeans. And the way it all started in the "cultured" Germany of operas, fine arts and fancy theaters was with gratuitous hate, much of it expressed in cartoons. 'Gratuitous', since Germans weren't under Jewish occupation, nor had they any other such justification for it. Jews are forever agonizing over how they allowed what started out as expressions of hate, often in cartoons, to progress into 'The Holocaust'; why they didn't raise an uproar about what fellow Jews were undergoing. Now they're determined to never let it happen again. That's why a UN member state - Israel - sent its air force, not mere riots at embassies, to bomb another nation's - Iraq's - nuclear facilities to preclude another Holocaust. Compared to such an extreme measure, in hindsight, if Jews had only persistently and intensely protested at German embassies back in the 1930s, that most horrendous of atrocities in human history might have been less severe, if not totally averted. So, perhaps the reaction to the potential kernels of a new round of persecution against the latest targeted minority in Europe - Muslims - is not an overreaction. After all, it's not as if it's a far off fantasy. Muslims have already suffered one genocide in Europe - as classified by the UN. Just over 10 years ago, again in the heart of Europe not in some remote jungle, some 8,000 Muslims were rounded up and massacred, Nazi-style, in Srebrenica, Bosnia. And that was only one of many massacres that they suffered at the time. At the Nuremberg trials, a notorious publisher of anti-Semitic cartoons - Julius Streicher - was given the death sentence, even though he had not personally killed anyone. A white Belgian journalist and radio show host - Georges Ruggiu - who worked in Rwanda during its genocide, was given a 12-year jail sentence for hate incitement. Hate incitement is the most dangerous weapon on earth, ahead of nuclear weapons. The Holocaust took 6 million innocent lives, and the Rwandan genocide almost 1 million, both by hate. And freedom of expression when abused transforms into such a weapon. The government of Denmark has refused to condemn a blatant element of that new targeting of a minority group in Europe, despite four months of peaceful, civilized, Muslim pleading. Muslims have every right, indeed, the obligation to nip this new wave of persecution in the bud so that someday they may not regret, like the Jews have, that they silently watched the evolution of the next cycle of human rights abuses in Europe. When an editor in a mainstream newspaper finds it appropriate, and expects it to be acceptable to his readers, to so callously and crassly treat a minority within his nation, it is already obvious that this minority is being viewed as lesser human beings and is treated as such. That, to the T, is how it all started in Germany. Dehumanize the targeted group to the point where the mainstream first accepts and then supports the hate, and following that they'll be indifferent to any mistreatment of the potential victims. And the rest is history. But to be fair to the Danes, much of the above hate has been going on in other parts of mainland Europe as well. The touted tolerance is only a veneer. Europeans speak of integration and the necessity of assimilation, but acculturation takes time. There's no pressurized acculturation cylinder into which you can pop people and presto, at the punch of a button they'll emerge fully Danish, German or Dutch. But that's precisely what Europeans expect and want. An instant Danish Muslim, and instant Dutch Muslim, and so on. And if the newcomers can't all transmute rapidly enough into full Danes or Dutch, then they deserve to be the targets of hate. But then again, the Jews were fully integrated for generations, and even occupied various high level positions in government, and yet were still targeted for hate. So in reality, it's a matter of racism not integration, the very racism that every single European colonial power practiced right across the globe in the past. Obviously, it's still there (where would it have gone anyway) and can't wait to practice its old ways on the first minority group that again dares come its way. There are over 10 million Muslims in Europe and when one of them - one person - murdered Dutch filmmaker Theo van Gogh, the racism came out full blown against the 10 million, as if some people were just waiting for the opportunity to practice their intolerance and hate of Muslims even further. As a matter of fact, when some two years earlier, the prominent anti-immigration Dutch politician Pin Fortuyn was murdered, the BBC reports that Dutch groups were ready to pounce on Muslims in Holland, and were disappointed when it turned out that a white Dutchman had committed the crime. Yet racists, shamelessly generalizing from a single incident - an obscene intellectual taboo - use that single murder to paint the whole 10 million European Muslims with the same brush! The Danish government wasn't asked to censor free speech, simply to distance itself officially from such offensive material by unequivocally condemning it. It failed even that simple test of civility. But then, as the Danish reporter wrote, Danish tolerance is apparently a myth. The question never was one of Muslims objecting to criticism. Muslims are criticized, often severely and unjustifiably - as in the name-calling discussed here, day in day out in the Western media, and yet we don't see protests across the Muslim world. Muslim girls in France were forced to bare their hair at schools, and the most we saw were orderly protests in France, not riots across the Muslim world. Why, because people, even if angered by procedures that target them, can easily differentiate between objective criticism or government concerns, and gratuitous, uncalled for denigration of their most holy symbols. Source: The Middle East Times, Egypt.